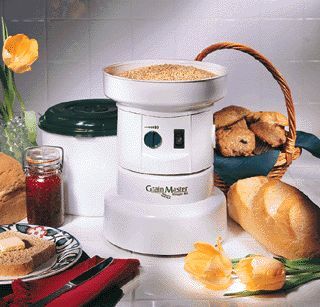 I have an older version of the Grain Master Whisper Mill. It doesn’t “whisper”, by any means, but does do a great job of grinding about 8 cups of wheat berries at a time. We consider freshly ground flour to be essential to a moist whole wheat bread, and prefer hard white wheat to hard red wheat for our baking. The hard red wheat yields a coarser, heavier bread, but maybe your family would prefer that. 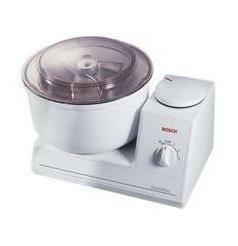 This is a newer version of the Bosch mixer that I use. Mine has a metal bowl, and may hold more dough than this mixer. The pictured mixer probably mixes dough for four loaves of bread. This entry was posted on Monday, March 12th, 2007 at 9:57 am	and is filed under Recipes. You can follow any responses to this entry through the RSS 2.0 feed. Both comments and pings are currently closed. wow looks great..i love to use my bosch mixer too…. 😉 thanks for sharing ideas…we will come back often.